Like all other advertisers, osteopaths have to comply with the ASA's CAP Code and the ASA/CAP publish specific guidance to help them — in addition to the more general guidance on National Council for Osteopathic Research and their substantiation. However, it seems that some osteopaths thought the CAP Code and guidance required some clarification. Today, the ASA have published even more detailed guidance for those advertising osteopathy services. This new document provides that clarity and further restricts the claims they can make about the use of osteopathy with pregnant women, children and babies, particularly non-musculoskeletal conditions such as colic and problems allegedly caused by 'birth trauma'. A cursory glance at osteopaths' websites will find many such claims. 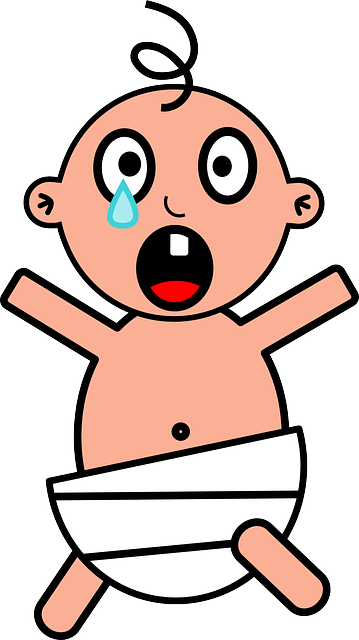 See, for example, the results returned by this simple search for colic: osteopathy clinic site:.uk colic. This is a widespread problem. The Osteopathic Practice Standards place a duty on all osteopaths to ensure their advertising complies with the CAP Code (Standard D14). Failing to comply with the Code and associated guidance or rulings could result in GOsC fitness to practise proceedings. The GOsC and the osteopaths' trade body, the Institute of Osteopathy (IO) will be following this up with further communications and articles in various magazines and the GOsC will also be contacting the various osteopathy training organisations to make sure students are fully aware of their responsibilities. We hope that many students will ask questions of their tutors about why they are being taught something they are not allowed to advertise because of the lack of good evidence. Perhaps the GOsC should be asking themselves the same questions and revist their educational requirements. There is a lot of work to be done by osteopaths. An osteopathic check-up following the birth can help pin-point potential problems and helps to ease the dramatic transition from life inside the womb to the outside world. This initial adjustment involves many bodily systems such as breathing and digestion. Stresses and strains from the labour or pregnancy can lead to unsettled behaviour and difficulties with feeding, winding, bowel movements and sleeping. Relieving any physical strains with gentle osteopathic treatment can be very helpful and relaxing. The care of the entire family unit is of the utmost concern for an osteopath. This is a time when children learn to crawl, walk, run and communicate and are keen to explore their environment and to interact socially. It is desirable to monitor the progress of these early developmental milestones and to address the effects of any major physical mishaps or developmental lag to prevent problems developing in future. In the birthing process babies are subjected to enormous forces during their passage through the birth canal. Small amounts of movement exist in the infant skull to permit the baby’s head to adapt to these forces of labour. However when birth is difficult, unduly slow or fast, or complicated by the need for forceps ventouse or cesarean section delivery, the infant head may not fully recover from this distortion. If the baby is unable to resolve the stressors and strains naturally through breathing and suckling, these pressures with in the skull may lead to problems settling, feeding difficulties, disturbed sleep patterns and recurrent infections. Osteopathic treatment using a variety of gentle non invasive techniques may help improve the function of the musculoskeletal system and aid in the reduction of these symptoms. During childhood, in addition to any earlier trauma or strains the body has to adapt with the growth and development of the bones and muscles. Postural changes and activity level changes with participation in sports can also produce aches and pains which may be eased with manual therapy. Restrictions in the musculoskeletal system can sometimes cause delay reaching developmental milestones for behaviour, speech and learning and may benefit from osteopathic assessment and treatment. What parent would not be distressed by such stark warnings and sign their new-born up for immediate (and life-long?) treatment? The Bronfort review was commissioned by the General Chiropractic Council (GCC) in 2009 after I submitted 523 complaints to the GCC about claims being made by chiropractors on their websites — the GCC needed the review because they didn't have a clue about the evidence for the claims their registrants had been making. It was little more than a quick literature review carried out by chiropractors in the US. Even though Bronfort et al. considered all manner of treatments including reflexology, massage and chiropractic manipulations and not just osteopathic techniques specifically, it did look at various paediatric conditions. In terms of the non-musculoskeletal conditions, Bronfort identified a number of systematic reviews and additional RCTs for these conditions. None was positive for any treatment. However, it only gave results for the treatment of manual therapies for musculoskeletal conditions for adults and is silent on pregnant women, children and babies, so it's quite a leap to extrapolate to those patient groups from adults. The National Council for Osteopathic Research (NCOR), funded by osteopaths and the GOsC, is currently undertaking a systematic review of manual therapies in the treatment of children and babies. It'll be interesting to see what they finally publish. Meanwhile, it seems that the ASA believe that osteopaths are trained to treat pregnant women, children and babies and that they should therefore be allowed to make claims about these patient groups, despite being no good evidence that osteopathy is effective for these conditions. This simply raises the question as to what they are being taught if there is no good evidence it is effective for those groups in the first place. The question of dose response is not addressed either nor the potential for harm — particularly the many claims that it is 'safe and gentle'. However, that only applies to musculoskeletal conditions: the new guidance prevents them from directly or indirectly referring to conditions such as colic, growing pains, excessive crying and those allegedly caused by 'birth trauma'. As we have shown above, these are frequent claims. …refer to conditions for which medical supervision should be sought if they hold convincing evidence of the efficacy of their treatments (Rules 12.1 and 12.2). The caveat of holding the necessary standard of evidence is important, but it is not clear to us why statutory regulation should confer any special privileges: whilst the Osteopaths Act 1993 does provide for a means of regulating some aspects, it's primarily a means of protecting the title 'osteopath', ensuring registrants are appropriately insured and that there's a code of conduct and a complaints procedure. Notably, the Act does not prescribe any scope of practice, nor proscribe any treatments. This leaves the public open to being misled. Claims made on osteopaths’ websites that serve the purpose of encouraging consumers to make a transactional decision (i.e. claims that directly or indirectly invite individuals to consider seeking osteopathic treatment for themselves or someone else must comply with the Advertising Code. As healthcare practitioners regulated by statute, osteopaths may offer advice on, diagnosis of and treatment for conditions for which medical supervision should be sought. Those claims should be limited, however, to those for which the ASA or CAP has seen evidence for the efficacy of osteopathy for the particular condition claimed, or for which the advertiser holds suitable substantiation (references to conditions which the ASA or CAP accept osteopathy can help with should be understood on this basis, the ASA acknowledges that new evidence may emerge).2 The ASA retains the right to ask to review evidence for the purposes of resolving complaints should it consider the need to do so. Osteopaths should therefore ensure that they have access to substantiation before making such claims, including implied claims to treat a particular condition. Where the efficacy of osteopathy for treating a particular condition has already been established, treatment claims that do not stray beyond the principles set out in the CAP Guidance will be considered compliant with the Code. Osteopaths may make claims to treat general as well as specific patient populations, including pregnant women, children and babies provided they are qualified to do so. Osteopaths may not claim to treat conditions or symptoms presented as specific to these groups (e.g. colic, growing pains, morning sickness) unless the ASA or CAP has seen evidence for the efficacy of osteopathy for the particular condition claimed, or for which the advertiser holds suitable substantiation. Osteopaths may refer to the provision of general health advice to specific patient populations, providing they do not make implied and unsubstantiated treatment claims for conditions. The principles don't say anything new, but the fourth one is important: osteopaths can claim to treat pregnant women, children and babies, but they can only do so in terms of the conditions listed above and it clearly states the conditions they should not claim to treat. The guidance also gives some examples of claims that are likely and unlikely to be acceptable. The ASA, quite rightly, steer clear of saying outright what is and isn't acceptable: every claim has to be analysed individually in its proper context. We hope that osteopaths will take note of these carefully and not try to take advantage of any perceived equivocation. It might take osteopaths a while to clean up their websites. It's entirely fanciful, of course, but many osteopaths seem to believe it is effective for many childhood conditions and is seen by some as the 'bait and switch' used by some osteopaths to get new customers from a very early age. But at least now they cannot claim that they can feel these movements nor that they can then manipulate the skull to alleviate anything. This guidance is a great step forward. Osteopaths now have absolute clarity about what they can and cannot claim for pregnant women, children and babies and we hope to see speedy changes to websites. We also welcome the actions taken by the General Osteopathic Council to ensure their registrants stop misleading the public and we hope they will follow through when they are made aware of non-compliant websites; we also hope they will be pro-active in this and not simply wait around for others to submit complaints. We now hope the ASA and the General Chiropractic Council will now do the same for chiropractors — it is long overdue and, arguably, a much larger problem. The list of allowed chiropractic claims will be shorter, of course, and the list of unacceptable claims longer. Much longer. The Society of Homeopaths seemed to be taking responsible action to curb the claims of their members. But what's been going on behind the scenes? 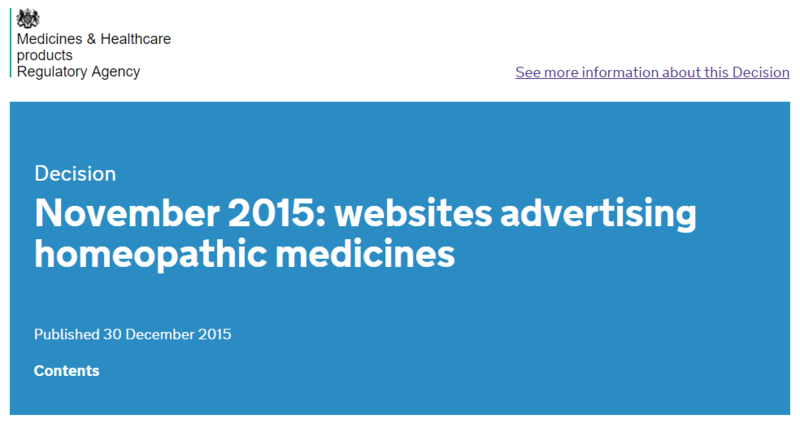 Little more than a month ago, the Society of Homeopaths (SoH) issued new advertising guidance to all their members. It was far from perfect and, we believe, strays some distance from the guidance laid down by the Advertising Standards Authority (ASA/CAP), but, being generous, at least it was a step in the right direction in curbing the worst excesses of its members' advertising claims. The ultimate sanction is referral by the ASA to the Trading Standards under the Consumer Protection from Unfair Trading Regulations 2008. Trading Standards is the legal backstop for the ASA. What this means is that where the threat or application of our sanctions have failed to achieve compliance, the matter may be formally referred to Trading Standards. Trading Standards will consider cases to determine if there are breaches of relevant legislation and take appropriate action in accordance with its own enforcement policy. These are serious consequences for any homeopath and it may look like the SoH has faced up to its responsibilities and taken the responsible course of action in trying to help its members comply with the CAP Code and consumer protection legislation. However, we now know that the SoH is not only supporting an anti-ASA campaign by some of its members, it is also seeking advice on the legality of the ASA's actions with a view to challenging them in the courts. Andy Lewis of The Quackometer has highlighted that the Society of Homeopaths (SoH) intend to fight the Advertising Standards Authority (ASA) over the advertising guidance they issued recently. They're not doing this by providing high quality scientific evidence that substantiate claims for homeopathy made by their members, of course, but by trying to find a legal basis to undermine the ASA's legitimacy as the UK's independent advertising regulator. …investigate allegations of illegal bias against homeopaths and homeopathy by the Advertising Standards Authority Ltd, in breach of Consumer Protection Regulations. The 6 RSHoms claim that the ASA has no legal basis for what it is doing and is acting unreasonably in targeting homeopaths. This admission that the 'legislative and national statutory guidance' are not written specifically to cover errant homeopaths but are laws and regulations that are designed to protect consumers from misleading practices by any and all traders is interesting. Their arguments against the ASA are well-worn and have been thoroughly refuted. They do try the old 'the ASA is only a limited company' meme and refer to them as the ASA Ltd: perhaps we should refer to the SoH by their own corporate title, The Society of Homeopaths Ltd? Anyway, in their guidance to their members, the SoH made several interesting statements with reference to the Professional Standards Authority (PSA) who legitimises them by placing them on their list of Accredited Registers. We submitted a Freedom of Information Act (FOIA) request to the PSA for details of all information held by the PSA relating to the SoH's guidance. Sorry to chase you but I wanted to update you on a serious initiative by ASA/CAP. See attached letter [download here]. In short, with no notice or consultation at all, they want to impose guidelines on us, send them out inside a month and then chase all our members to make sure they have complied within a month! You will not be surprised to hear that we have refused to co-operate but we have said that, if they pause the process, we are more than happy to meet with them and see if we can work out a way forward that ensures our members are compliant to reasonable guidelines. We need to be working with them in the long run, rather than working against them. As far as I am aware, no other accredited register has been targeted. I am guessing they will be in time! The belligerent nature of their language puts into context the SoH's latest pronouncement about taking legal action against the ASA and the assumption of being singled out by the ASA for special treatment speaks volumes. No doubt such a line would play nicely to their vexed members. That the SoH refused to even cooperate with the ASA is extraordinary (even if they did recognise they will have to cooperate eventually) and we sincerely hope it raised more than a few eyebrows at the PSA. Standard 8 requires registers to set standards of business practice, including advertising (and to comply with the Advertising Standards Authority’s requirements). The Society must replace the section of its Code of Ethics and Practice relating to Advertising and Media which states ‘Examples of Codes the Society may also take account of are the relevant clauses of The UK Code of Non-broadcast Advertising, Sales Promotion and Direct Marketing (CAP Code), and the current guidelines of the Society’ with ‘will take into account’. This action to be completed within three months. The PSA's views of the necessity of complying with the ASA's rules could not be clearer, but here we have am Accredited Register not only wanting special, more 'reasonable' — presumably less stringent — privileges but actively seeking to take legal action against them. But why this talk of 'no notice or consultation'? The ASA's remit was extended to cover traders' websites on 01 March 2011. The ASA issued clear guidance specifically for homeopaths in September 2011. The ASA's adjudication against the SoH themselves was published on 03 July 2013. There can surely be no excuse for the SoH not to be aware of their obligations under the CAP Code yet they and their members have already been given five years to comply. What have they not complied already? How much more time do they need? It does seem to us that the SoH were looking to the PSA for some protection from those baddies at the ASA. However, other than an informal discussion between them on 12 January, no more appears to have been said. Hopefully the PSA will have reminded the SoH at that meeting of their responsibilities under the Accredited Register scheme. But it seems the SoH were successful to some extent in delaying the ASA's action: their letter finally went out to homeopaths up and down the country in September this year and they were given a full five weeks in which to get their websites in order — five years eight months after the rules came into force for websites. When referring to testimonials, it is wise to encourage people to seek independent medical advice and stay in close contact with their mainstream healthcare professionals. This supports an open dialogue, choice and informed, integrated care. The below was agreed by the Preliminary Investigation Panel, the Professional Standards Authority have also seen this statement, and appear happy with its use. Declaring that the PSA 'appear happy' with their interpretation of the ASA's guidance on testimonials seemed rather odd and informal language to us: did the PSA fully agree with the statement or did they not? Did they even have a view on whether such a disclaimer would adequately protect them from the ASA? 1. What communication has there been with the SoH on this? The testimonials were discussed as part of last year’s reaccreditation process, in particular the annual review report, we sent all of the information except the information we consider exempt to you in November 2015. There have been no further discussions about the testimonials since this date. 2. What does the statement that you 'appear happy' with the use of these statements mean? It is our understanding that this relates to the statement in the published panel decision in 2015. The decision reflects the fact that the panel was made aware of the above but made no specific comment for or against it. 3. Can you confirm that you told the SoH that the use of these statements by their registrants in their advertising was acceptable to you? We have made no specific comment about this matter beyond what is said in the 2015 decision. This is because we consider this to be a matter for the ASA. The Society [of Homeopaths] also found guidelines relating to testimonials were restrictive and could prevent registrants from providing sufficient information for service users to make informed decisions. The Panel noted the Society has provided a disclaimer for registrants’ websites to make clear testimonials are not intended to make any false claims about homeopathy. It's not at all clear to us how the SoH interpreted that as saying that the PSA 'appear happy' with the SoH's disclaimer, but now that the PSA have made it clear they believe it to be a matter not for them but for the ASA, we sincerely hope the SoH will update their guidance to clarify the PSA's position on this and update their guidance to bring it in line with the ASA's. Please note: Any claims made within a testimonial are subject to the CAP Code. Therefore, if a testimonial makes an efficacy claim, the author’s permission should be sought to edit out the relevant parts. Although this is an important part in the ASA's guidance on testimonials and endorsements, it is but one part of it. Overall, the SoH could have saved themselves a lot of bother by simply referring their members directly to the ASA's own comprehensive and clearly written guidance rather than regurgitating it and interpreting it, changing it in the process, inadvertently or otherwise. As well as writing to thousands of homeopaths, we have been made aware that the ASA have also contacted at least one trade directory, informing them of the requirements to comply with the CAP Code. I can appreciate how you and other Homeopaths currently feel and I hope that this email will help your understanding as to why we have made these changes. Because this is now a legal requirement for advertising, as a marketing platform, we must abide by it. CAP were the ones that contacted us about the changes which is why we have actioned it. I can see that you have already complied [sic] a detailed document raising your concerns, but please also have a look here: http://www.homeopathy-soh.org/images/ASASept2016/ASA-Guidance-6.pdf [the SoH's advertising guidance] as this may prove helpful for you when addressing this with the ASA / CAP. I would recommend contacting CAP as they are the ones that have implemented these changes and are therefore the ones to speak with. Unfortunately, because we are a marketing platform and not therapists ourselves, as mentioned before we must adhere to these changes and won't be challenging this with either the ASA or CAP. Please do keep us updated, I believe that you will receive a great amount of support from other Homeopaths that are currently experiencing the same. It's good to see the ASA taking such a comprehensive approach to cleaning up this sector and Therapy Directory's responsible action to comply with the ASA's rules. We hope all homeopaths, their trade bodies and other trade directories follow this responsible lead. But to return to the SoH in particular: is there really a conflict between representing your members best interests and complying with the rules, regulations and laws they are supposed to? That depends on what you believe is in your members' best interests. The SoH seemed to have taken a responsible approach to persuade its members to comply, but the other face they now show wants to challenge the ASA in the courts. It'll be interesting to see how far they get, but it would be perverse if it was believed that continuing to defy the advertising regulator and face possible conviction under consumer protection regulations was in the best interests of any homeopath or of the SoH itself. The Society of Homeopaths Ltd are at a crossroads: they need to grapple with the choice they face and decide whether they will go down the path of challenging the ASA or finally face up to their responsibilities as a supposed professional regulator, overseen by the Professional Standards Authority. This will also be a challenge for the PSA: how they deal with a wayward SoH will be a test of their willingness and ability to properly oversee their Accredited Registers and properly protect the public. 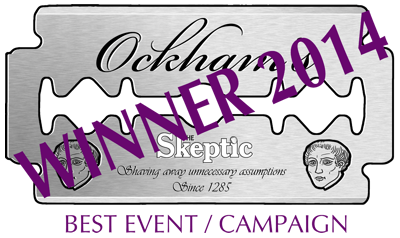 In March 2011, our very first campaign was against the misleading advertising claims made by homeopaths on their websites. That was six years ago, and we gave the Advertising Standards Authority a huge headache: how to persuade homeopaths to abide by the same rules all advertisers have to abide by. Without those advertising rules (in the form of the CAP Code), advertisers would have free rein to make whatever claims they wanted; it would be a wild-west for all sorts of cowboys and quacks and one where the poor consumer would suffer. Homeopaths have featured in the ASA's list of adjudications and informally resolved cases over the years, but the ASA have recently preferred to let their Compliance Team deal with homeopathy advertisers because they had already extensively reviewed the evidence — notably through complaints about the Society of Homeopaths and homeopath Steve Scrutton, Media & Communications person at the Alliance of Registered Homeopaths — and had an established position on it. Read more about these adjudications in: Landmark decisions for homeopaths. A few advertisers have been somewhat recalcitrant, believing they could face down the ASA. Some even seemed to think the ASA could be ignored, but many have found that is not a sensible course of action and one that's not good for their business. However, many advertisers of complementary and alternative therapies appear in the ASA's list of Non-compliant online advertisers and others have been referred to Trading Standards (TS). Trading Standards have now successfully prosecuted 'Electronic Healing' (a provider of complementary and alternative therapies and devices) who had been referred to them by the ASA. TS have also had numerous websites taken down: they cannot be ignored. We have no doubt that many homeopaths were just not aware of the advertising rules or the need to abide by them. Many will now comply because they understand the need for rules to protect consumers and are responsible traders who want to stay on the right side of the law. But not all. Today, the ASA announced that they have written to homeopaths across the UK to remind them of the rules that govern what they can and can’t say in their marketing materials, including on their websites. This included their previous Guidance for Advertisers of Homeopathic Services and FAQs about advertising regulation and the sanctions the ASA can impose. It also builds on the advertising guidance published by the Society of Homeopaths (SoH) a few days ago, which had been reviewed by the ASA. You may remember that the SoH themselves fell foul of the ASA three years ago and an adjudication against numerous claims they made on Twitter and on their website found they had breached the CAP Code on multiple counts. Read more about the adjudication in: Landmark decisions for homeopaths. While we generally welcome the guidance from the SoH, we believe this guidance is incorrect and misleading in places and goes beyond what we believe the CAP Code allows, but at least it's a step in the right direction. Whether they ensure their members now comply with the CAP Code remains to be seen. With the ASA's letter to thousands of homeopaths, their published guidance on compliance and the SoH's letter to their members, there really is now no excuse whatsoever for homeopaths to continue to make misleading claims. After the expiration of this period, we will carry out extensive monitoring spot checks. Homeopathy practices that have failed to comply will be contacted again. After this time, we will consider the application of appropriate sanctions. This is the culmination of six years of campaigning for us — our initial campaign and the occasional prodding of the ASA and submitting the odd strategic complaint. Although there is much more still to do, we've done our bit to highlight the many issues with homeopathy advertising: it is now up to homeopaths to take the responsible action they know they must. Perhaps the Society of Homeopaths could set a good example to its members by having a thorough review of its own website? 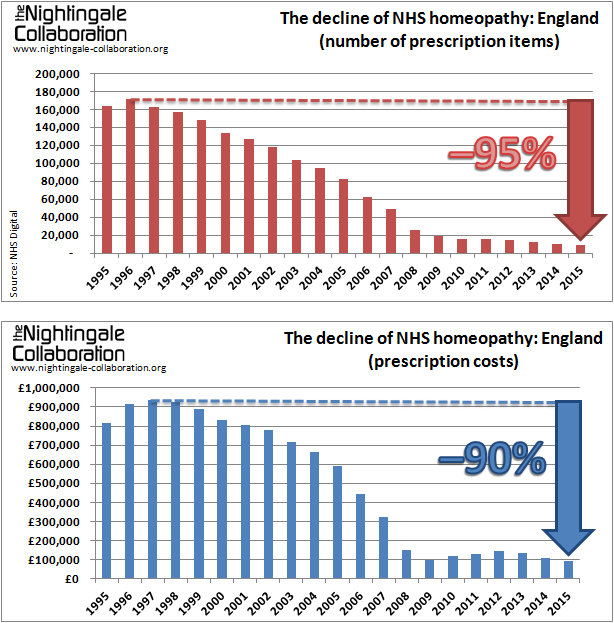 We've previously looked at how homeopathy in the English NHS has plummeted 95% in the last two decades. We now focus on what's been happening is Scotland. Their Prescription Cost Analysis (PCA) data since 2001 (shortly after devolution in 1999) are available on one handy webpage, making them easier to find, with each spreadsheet covering the financial year from 01 April up to 31 March of the year given in the filename. The latest spreadsheet, PCA_2016.xlsx, therefore covers 01 April 2015 to 31 March 2016. Note that for consistency with the data for England, we have attributed the Scottish data for the year in the filename to the previous year in the charts below, ie the 2015/2016 data are attributed with 2015 to match the way the data for England have been attributed. Tab 3 - BNF sub-section gives the data we need. As with the NHS Digital (the re-branded name for the HSCIC) data for England, the data relate to the NHS prescriptions dispensed in community pharmacies and by Dispensing Doctors in Scotland. The main measures of drug ingredient cost and volumes of items dispensed in the community are comparable across the UK countries. However it should be noted that the gross ingredient cost (GIC) within Scotland is equivalent to the net ingredient cost (NIC) in England, i.e. the reimbursement cost of drugs before any pharmacy discounts are applied. A spreadsheet with these data can be downloaded here. But why the small rise in prescriptions in 2012 and 2013? Was there a resurgence in public demand for homeopathy? Perhaps more GPs became convinced of its curative power? Maybe some new, compelling evidence for homeopathy hit the headlines? Probably not. 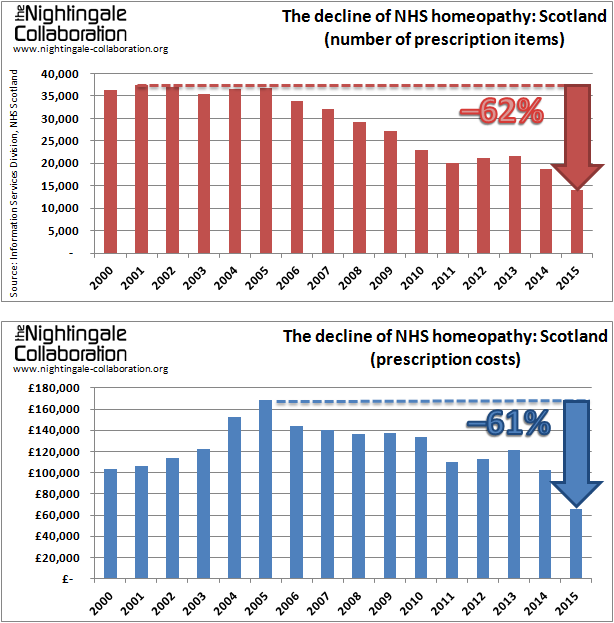 The answer is more prosaic: the closure of the pharmacy at the Glasgow Homeopathic Hospital (re-branded the Centre for Integrative Care (CIC) recently) in 2011 will have caused a small increase in the number of prescriptions dispensed in community pharmacies. The prescription numbers before 2011 don't include those dispensed at the GHH/CIC, but those after 2011 are inflated by the ones GHH/CIC patients have had go to their local community pharmacy to have dispensed. But note that this blip is more than wiped out by the falls in 2014 and 2015, leaving an overall 62% drop in the past ten years. The drop isn't as great as the 95% in England, but it is still very significant. Referrals to the GHH/CIC have been stopped by various Scottish Health Boards, putting pressure on them — it would seem unlikely that the long-term downward trend will be reversed. The number of patients at the GHH/CIC has been falling in recent years. Data from NHS Greater Glasgow and Clyde (GGC) — the health board that runs the GHH/CIC — show significant drops in the number of new inpatients from areas outside of GGCin recent years but that has been partially offset by an increase in numbers of referrals from within the GGC area. Overall, the number has still fallen 9% in the past four years to 332 in 2015 — about one new patient a day. Similarly, falls in the number of new outpatients referred from areas outside GGC has been compensated by an increase in local referrals, leaving the number hovering around the 1,000 mark each year — in the order of three new patients a day. They also had 4,723 return appointments in 2015. The hospital is currently facing the closure by GGC of its seven inpatient beds (which had previously been cut in 2010 from 15 beds Monday to Sunday to seven beds Monday afternoon to Friday morning), saving £190,000, putting it under further pressure. The Unit has reduced its inpatient service in recent years from a 15-bedded seven-day unit to only 7 beds, open 4 nights a week. The Centre has been very successful in developing an ambulatory model of care and all services are now available on that basis. Inpatient capacity is now underutilised delivering only 332 episodes of care each year. This will be further reduced by the continuing impact of decisions by other Boards to withdraw from the service, only 224 in patient episodes are provided for NHS GG and C residents. Inpatients account for only 5.2% of patient contacts for GGC residents. The majority of service delivery is already delivered in an outpatient setting. Supporters of the GHH/CIC are campaigning to prevent its closure, including a Public Petition to the Scottish Parliament: PE01568: Funding, access and promotion of the NHS Centre for Integrative Care. The committee has been considering this for well over a year and seem to be making little progress; instead they seem keen to show their inability to understand scientific evidence. If the closure is agreed by the GGC Board, this makes the GHH/CIC even less viable and it's not clear how long the hospital can last — its future is on a shoogly peg. Homeopathy has been diluted to just 13% of its former self in the past 14 years. But looking at the data in more detail reveals something that looks odd: last year, there were 60% more prescriptions in total in Scotland than in England. 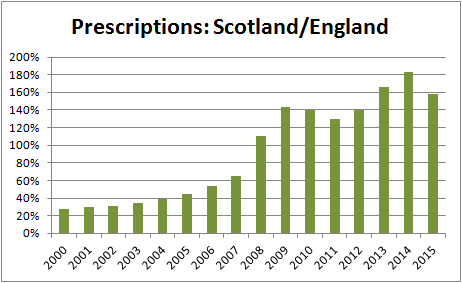 The figures equate to 2.62 prescriptions per 1,000 population in Scotland but only 0.16 per 1,000 in England. But this has changed over the years: in 2001, it was the other way round with 2.7 times more prescriptions in England than in Scotland. If it was simply down to population, you'd expect there to be more than ten times the number in England compared to Scotland. Why is this not the case and why has it changed like this over the last 14 years? One possible explanation might be to do with the number of NHS homeopathic 'hospitals' and the legitimacy they lend to homeopathy in general: there has only been the one in Scotland but there have been four in England in recent times: London, Bristol, Liverpool and Tunbridge Wells, plus a number of satellite clinics. Now, however, only the Royal London Hospital for Integrated Medicine remains, with the ones in both Liverpool and Bristol replaced by contracted private companies rather than being part of the NHS. The one in Tunbridge Wells closed in 2008. So, in its heyday around the turn of the century, Scotland was served by one but England was only served by four — proportionately far fewer considering the population. So, with the only the London hospital now remaining — even though it no longer has a dedicated homeopathy service — the decline of prescriptions in England was perhaps inevitable, following the decline in the number of hospitals. 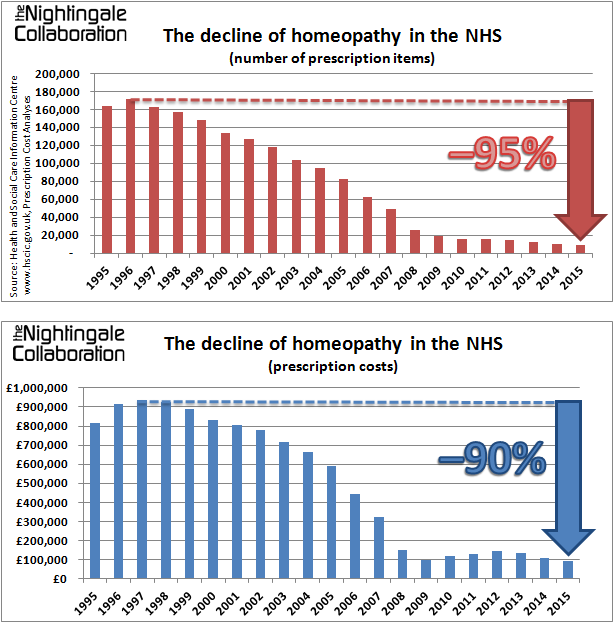 For those who do not believe public money should be spent on homeopathy, these figures will be welcome, but perhaps not so much for those in the homeopathy business as the false imprimatur given to homeopathy by the State plummets. 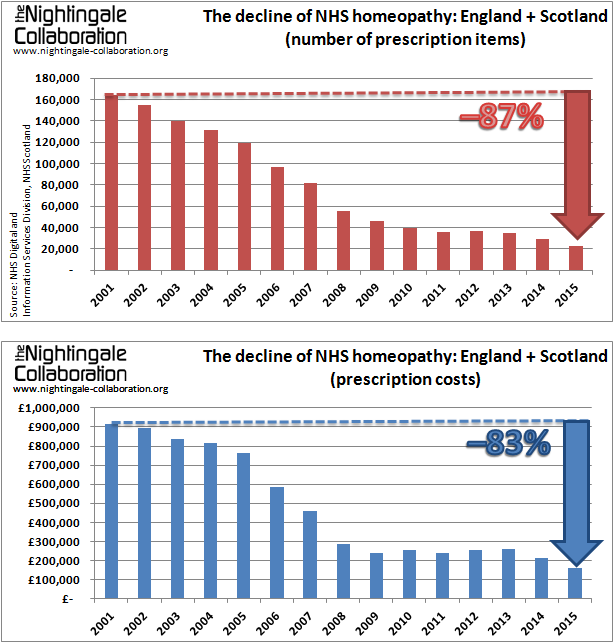 New figures released today show that homeopathy on the English NHS has fallen to a new low. The number of NHS prescriptions for homeopathy in England, fulfilled in community pharmacies, dropped by a further 13% in 2015 from the previous year and is 95% down from its peak nearly 20 years ago. The new figures for 2015 show that there were just 8,894 prescriptions, down from 10,238 in 2014. The total cost of these prescriptions has dropped to £94,313, the first time it has been below £100,000. This follows on from other recent blows to NHS homeopathy: the closure of the homeopathy clinic at the South Bristol Community Hospital in Bristol, the reviews by both Liverpool CCG and Wirral CCG on ending the funding of homeopathy via the Liverpool Medical Homeopathy Service and other successfully completed reviews. And the forthcoming Department of Health review of the blacklisting of homeopathy could mean CCGs are no longer able to prescribe it — not that many do now anyway. Dilution by dilution, succussion by succussion, sugar pill by sugar pill, homeopathy is slowly but surely being removed from the NHS. This will not be welcomed by homeopaths who businesses rely on the (undeserved and unearned) legitimacy that being provided on the NHS lends to homeopathy, but it's the inevitable result of the their own failure to provide robust evidence of its efficacy. …the interior ministry said it had come to the conclusion that it was “impossible to provide such proof for these disciplines in their entirety”. So, it's not that the Swiss authorities had come across good evidence that homeopathy (and the other treatments covered) were, indeed, effective; more that they gave in and decided to reimburse them anyway, despite the lack of evidence. Based on the assessment of the evidence of effectiveness of homeopathy, NHMRC concludes that there are no health conditions for which there is reliable evidence that homeopathy is effective. Homeopathy should not be used to treat health conditions that are chronic, serious, or could become serious. People who choose homeopathy may put their health at risk if they reject or delay treatments for which there is good evidence for safety and effectiveness. People who are considering whether to use homeopathy should first get advice from a registered health practitioner. Those who use homeopathy should tell their health practitioner and should keep taking any prescribed treatments. It is therefore perverse that the Swiss Government should appear to bend over backwards to ignore the evidence and agree to pay homeopaths for dispensing their magic sugar pellets. But it may not be as smooth a ride as the homeopaths might like. Reimbursement will only take place for treatments administered by certified medical doctors. Additionally, according to the official announcement in Komplementärmedizin soll anderen Fachrichtungen gleichgestellt werden, some criteria apply concerning tradition of usage and research, scientific evidence and medical experience and further education. Also, some treatments that are seen as critical are to be examined and potentially excluded from the reimbursement. It's not at all clear exactly what this will mean for the homeopaths, but this may not be the full endorsement from the Swiss Government they would like to believe. This Sunday is the anniversary of the birth of the inventor of homeopathy, Samuel Hahnemann, heralding the start of World Homeopathy Awareness Week. So as homeopathy on the NHS is in what must surely be its death throes, what better time to help others be aware of homeopathy? Follow us on Twitter and re-Tweet our Tweets on homeopathy throughout World Homeopathy Awareness Week. Homeopathy has suffered many body blows recently. A new decision by the medicines regulator rubs salt into its wounds. The last year or so has not been good for homeopathy. The comprehensive Australian National Health and Medical Research Council concluded that "there are no health conditions for which there is reliable evidence that homeopathy is effective." The FDA and the FTC in the US are considering their positions on the regulation and advertising of homeopathic products and will hopefully clamp down on the worst excesses of misleading claims made there. In the UK, homeopathy continues its downward spiral, it's being challenged in Liverpool and the Department of Health will consult next year of the complete blacklisting of homeopathy. 2016 is going to be a very interesting year for homeopathy. Last August, we published details of our complaints against Nelsons Homeopathic Pharmacy. We're still waiting for the General Pharmaceutical Council to complete their investigation, but the medicines regulator, the MHRA, has already published their decision. In that newsletter, we said we were waiting for a further response from the MHRA. Although we're still waiting for a formal reply from them, the essence of what we were waiting for has just been published by them in yet another complaint about homeopathic products. Tissue Salts are not homeopathic but are homeopathically prepared micro dose minerals. Dr. Schuessler believed that it was most effective to follow the principles of homeopathy in their preparation – 1 part mineral to 9 parts lactose – mortar and pestle for 20 minutes bringing it up to a 1X and so on. They can be touched by hand and work differently in the body navigating all that you eat and ingest where they need to be. They are not as sensitive as homeopathics. They can be taken alongside food, coffee etc. 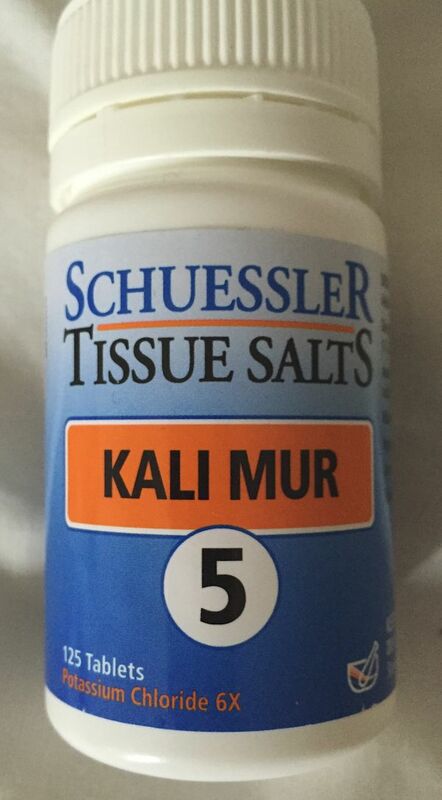 Tissue Salts are not Homeopathics but are micro dose minerals that follow the similar method used in preparation - they will not interfere with homeopathic Nat Mur - it is important to note that Minerals are not homeopathic, they are biochemic. They do not follow the rule of similarity as many consider but are prepared in the homeopathic manner in order to provide bioavailability. The system needs minerals in order to function in these minute doses. They are absorbed through the mucosa that enables them direct entry to the blood stream and the availability to the cells. 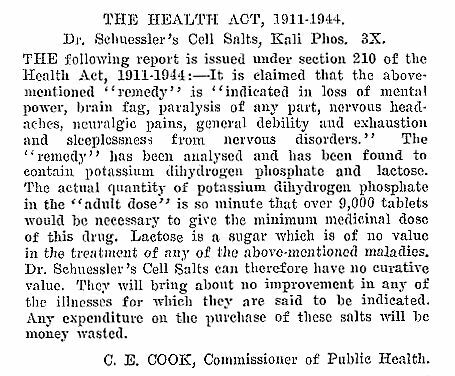 THE following report is issued under section 210 of the Health Act, 1911-1944:—It is claimed that the above "remedy" [Dr. Schuessler's Cell Salts, Kali Phos. 3X] is "indicated in loss of mental power, brain fag, paralysis of any part, nervous headaches, neuralgic pains, general disability and exhaustion and sleeplessness from nervous disorders." The "remedy" has been analysed and been found to contain potassium dihydrogen phosphate and lactose. The actual quantity of potassium dihydrogen phosphate in the "adult dose" is so minute that over 9,000 tablets would be necessary to give the minimum medicinal dose of this drug. Lactose is a sugar which is of no value in the treatment of any of the above-mentioned maladies. Dr. Schuessler's Cell Salts can therefore have no curative value. They will bring about no improvement in any of the illnesses for which they are said to be indicated. Any expenditure on the purchase of these salts will be money wasted. One of the main brands of these products is an Australian company, Martin & Pleasance, but there are others, including the New Era range (once owned by the pharmaceutical giant, Merck through their Seven Seas brand, but now owned by the Italian company, Olimed Ltd, sold in the UK by Power Health Products Limited). It was the Martin & Pleasance products we found being advertised on Nelson's website. Because they do not have a licence under the National Rules Scheme, an authorisation under the Homeopathic Rules Scheme nor even a (defunct) Product Licence of Right, we questioned whether these could be unlicensed medicines. The significance is that if the MHRA ruled they were unlicensed medicines, it would be a breach of the Human Medicines Regulations 2012 (HMR 2012) to advertise, supply or sell them. All other cases will be reviewed on a case-by-case basis. So, it's perfectly OK to advertise these products as long as it is not claimed that they are in any way homeopathic, they do not have a homeopathic 'potency' and they have no therapeutic indications. If they comply with all of these restrictions, they will not be medicines, but will simply be food supplements and have to comply with food regulations. This is essentially the same as when Bach Flower products were declared to be foods, not medicines nearly a year ago. The standard labelling of these products (such as the one in the photograph) stated they were '6X' 'potency' and the mere mention of this is sufficient to bring it within the MHRA's definition of a homeopathic medicine. This is a direct consequence of the EU Directives and the HMR 2012: homeopathic 'medicines' are regulated and anything that is presented as being homeopathic is a medicine and has to comply with these rules. If they are not presented in any way as homeopathic, then they are just foods, not medicines. There may be others and if you spot any on sale in the UK that appear to be contravening the MHRA's new guidance, please let us know and consider submitting a complaint to the MHRA about them. There is now no mention that these products are homeopathic. But what about the websites of the three sellers mentioned in the MHRA's decision? This is advertising New Era Calc Sulph (No.3) Tissue Salts and Brittle Nails & Falling Hair (Comb - K), but both are currently not available and another page says they have been discontinued. It looks like they also used to sell the Dr Reckeweg brand of tissue salts but they have been removed. 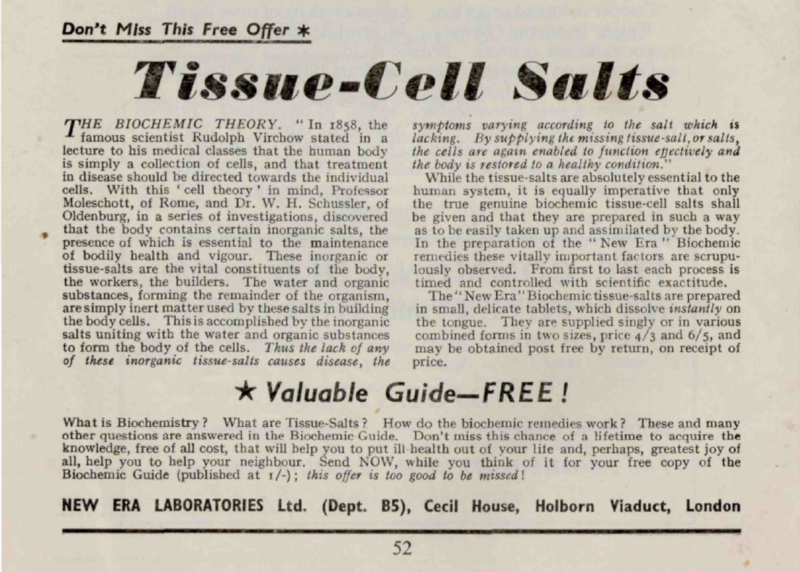 Whatever Schuessler/cell/tissue salt products they sold, they are no longer advertised on their website. Thirteen of the sixteen Schuessler products they advertise are currently out of stock. Schuessler Combination H Tissue Salt is a complete natural formula for hayfever and allied conditions with mag phos nat mur and silica. Hayfever is an allergic condition of the mucous membranes of the nose eyes and upper respiratory tract and is common during spring when sensitivity to pollen is severe but it is very treatable by combination H particularly if treatment is started from six weeks before the expected onset of normal symptoms. Many of the others have similar information. These would appear to be therapeutic indications and some refer to the potency as 6X, possibly contravening the MHRA's guidance so we'll be bringing these to their attention and hope that they will be corrected before the products return to stock. This is another step forward for informed consumer choice, but another blow for homeopathy. Gradually, sellers of homeopathy and homeopathy products are being held to account. Homeopathy is taking a beating, perhaps fatally wounded. It's a pity the Advertising Standards Authority wasn't around then.